Jelly Belly Sour Jelly Beans. An assorted bag of sour gourmet jelly beans. Each bag comes with a mixture of Sour Apple, Sour Cherry,Sour Grape, Sour Lemon and Sour Orange. Jelly belly has other sour flavored jelly beans, however these are the top selling sour flavors all mixed up in one yummy bag. 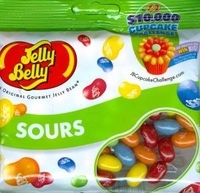 Jelly Belly Jelly Beans are known for their great flavors, these sours are no different. In each bite you get a fruity sour flavor that has you keep wanting more. Even if you are not a lover a sour jelly beans, you will be surprise just how much you will enjoy these little beans. We also have the original flavors, kids mix, tropical mix, soda shoppe flavors and kids mix. What ever your favorite is we have them. Each bag is 3.5 oz of fruity chewy fun.